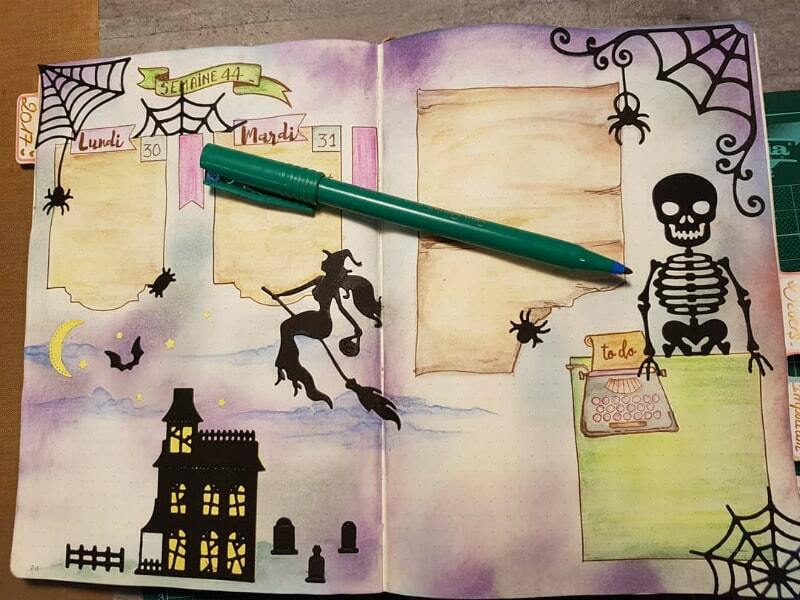 Your choice of colour can create a halloween vibe. 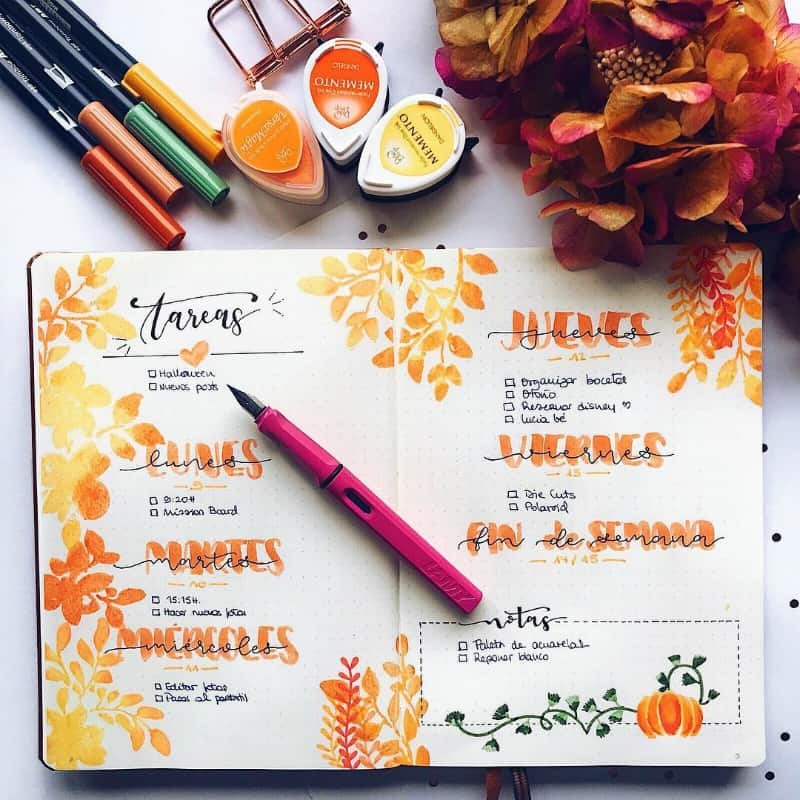 Colours such as orange and black are great, reminding us of carved pumpkins synonymous with Halloween. 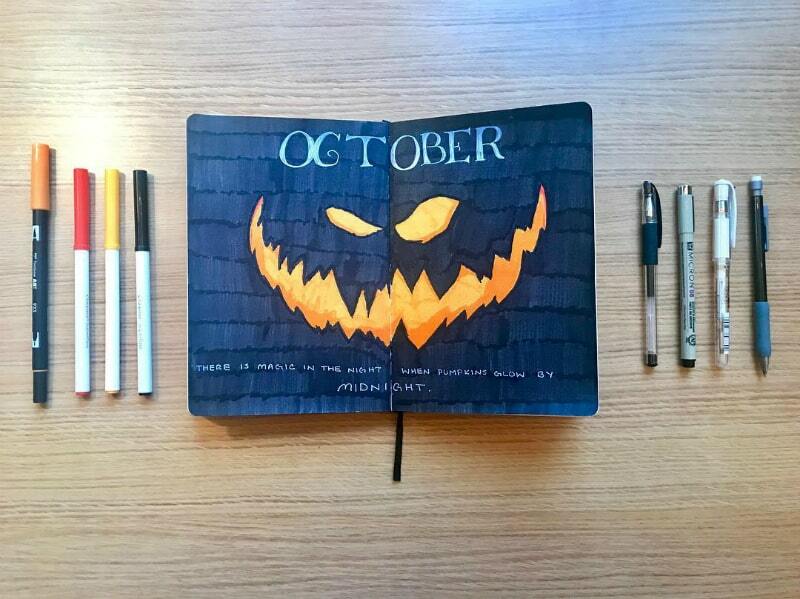 Or go for a creepier look by using lots of black. 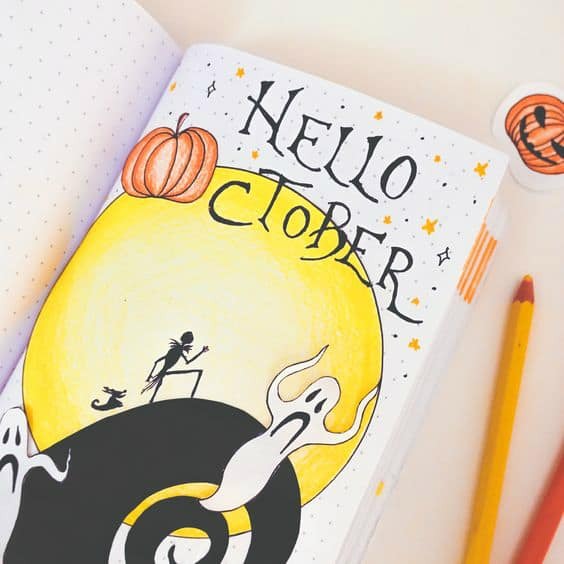 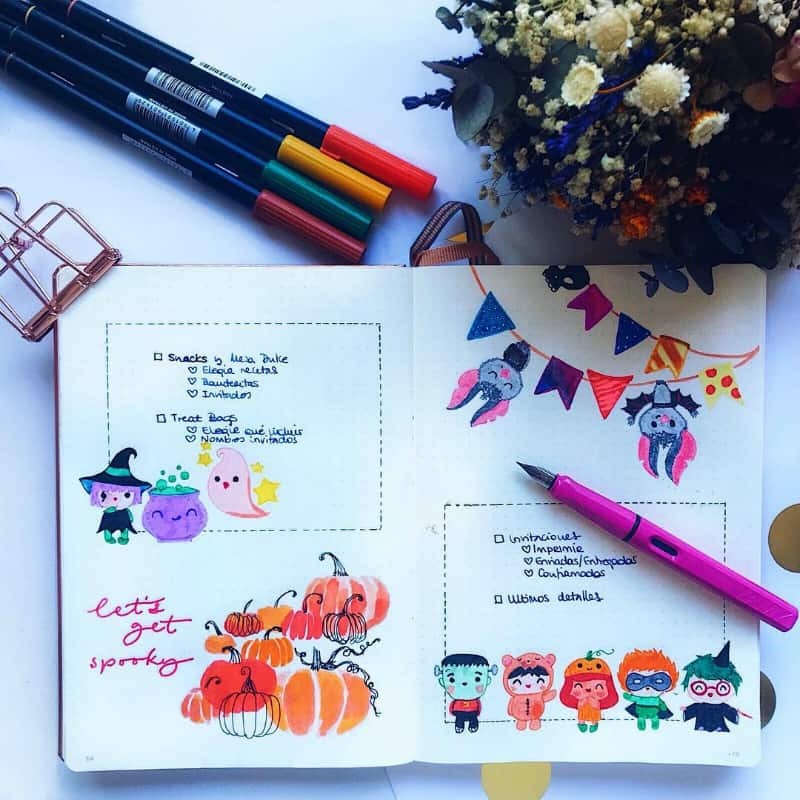 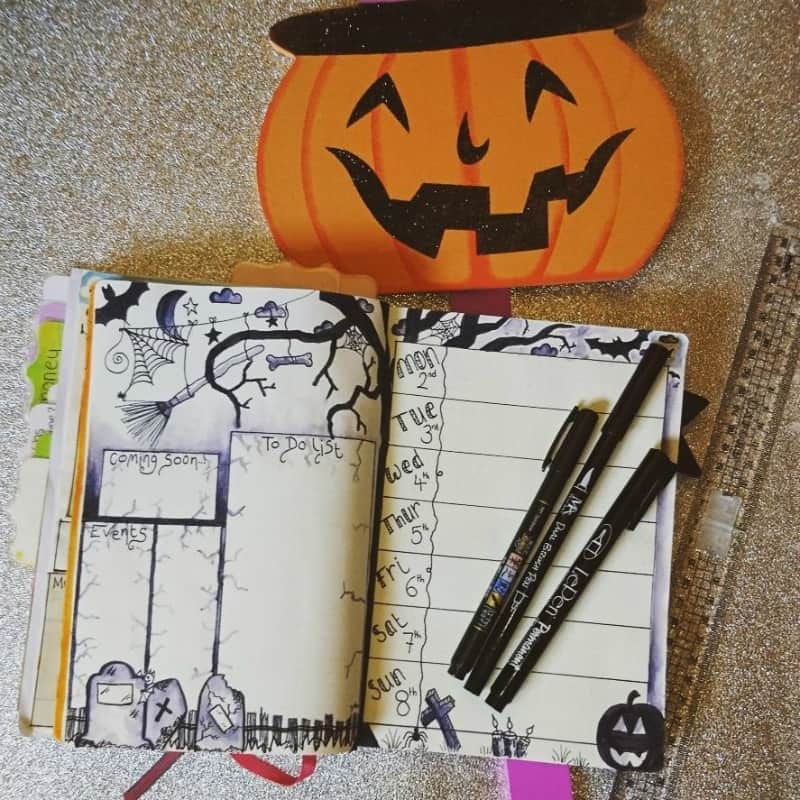 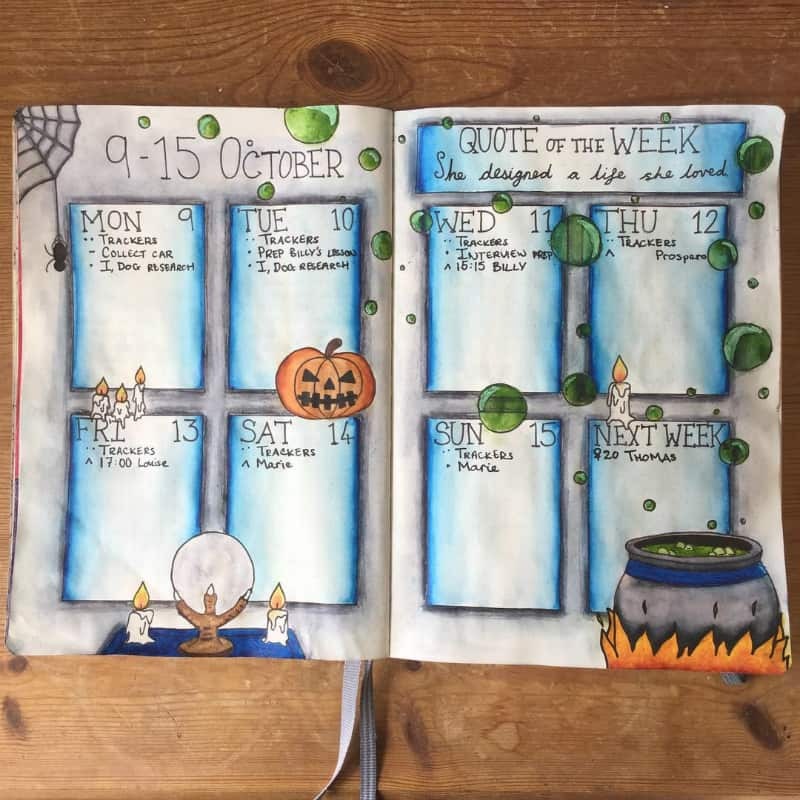 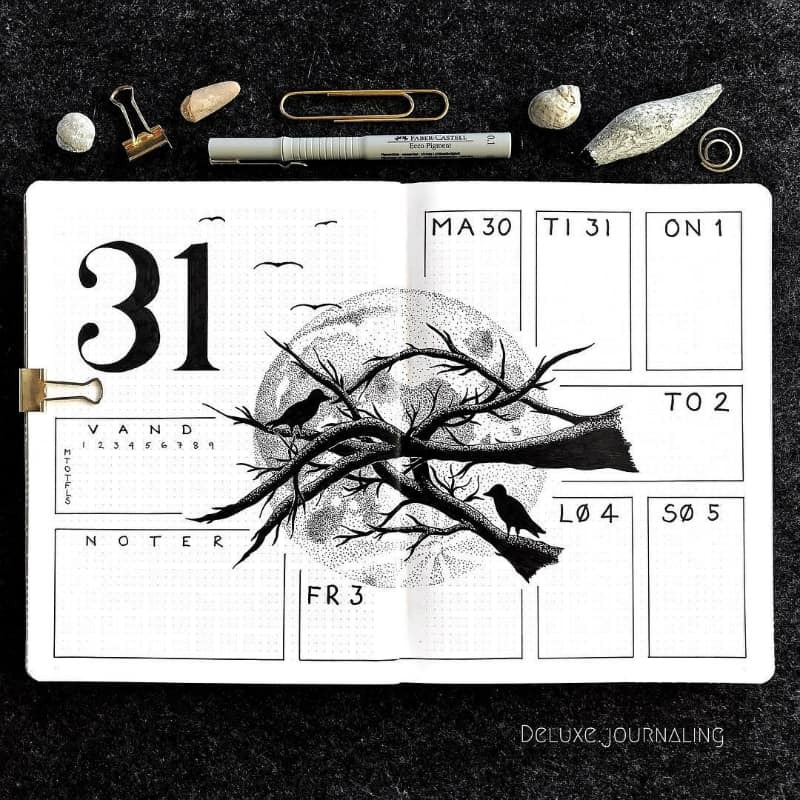 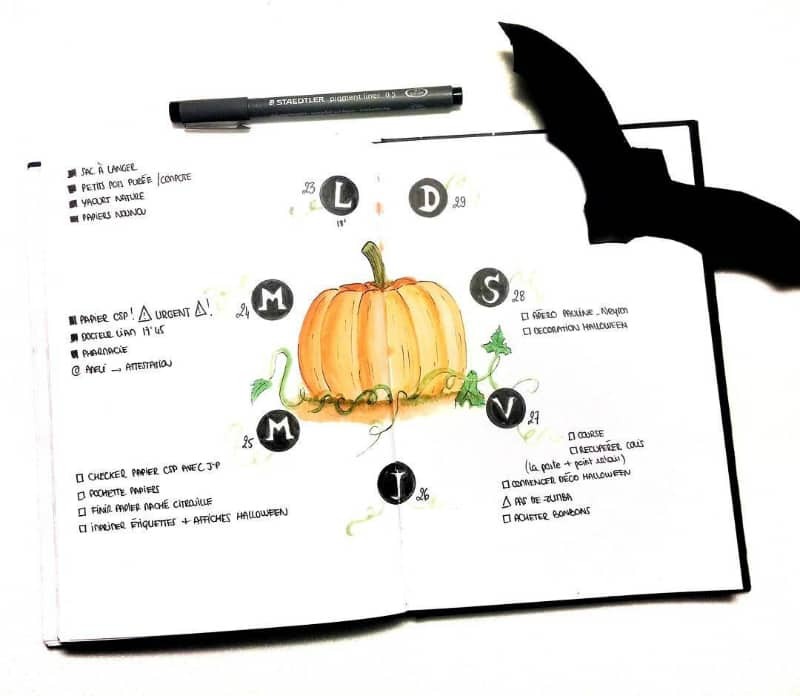 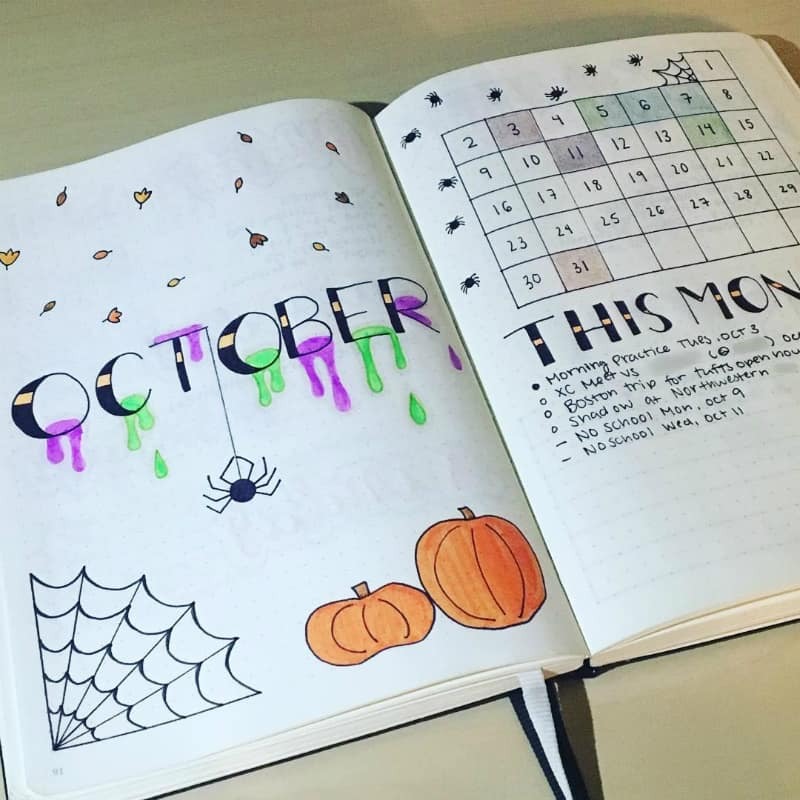 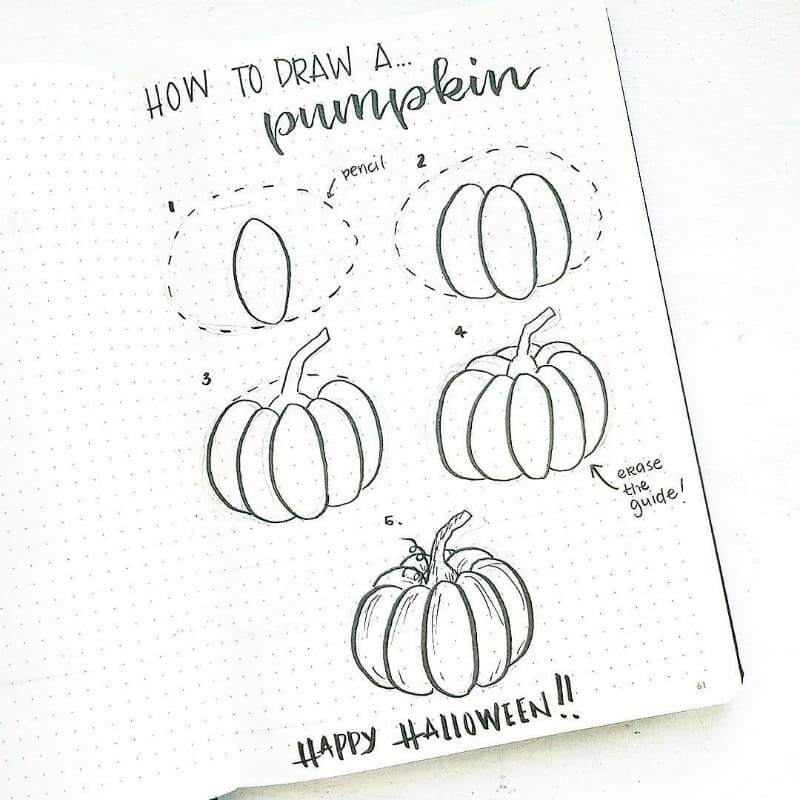 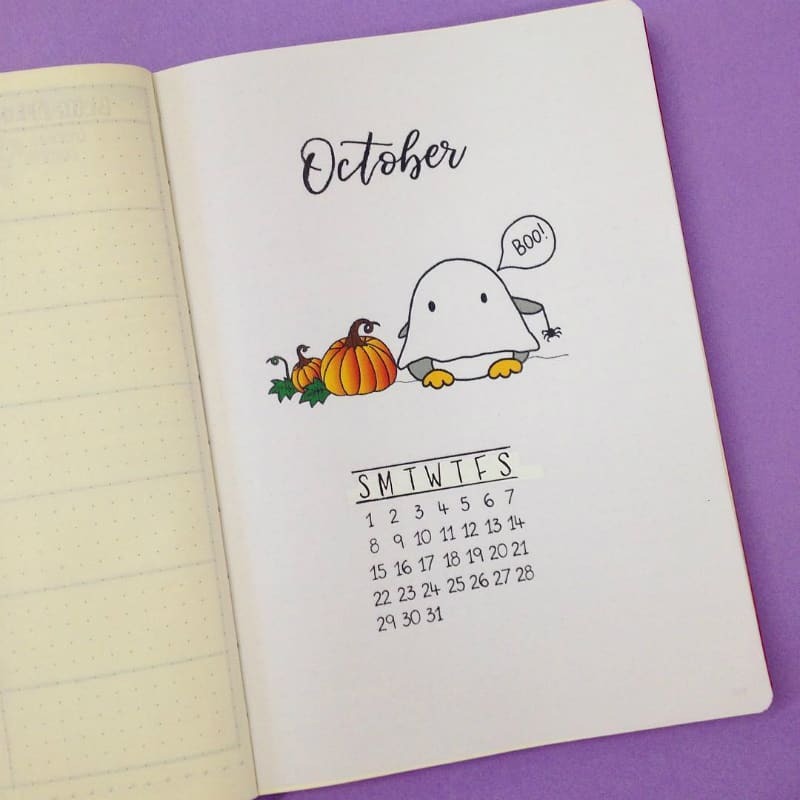 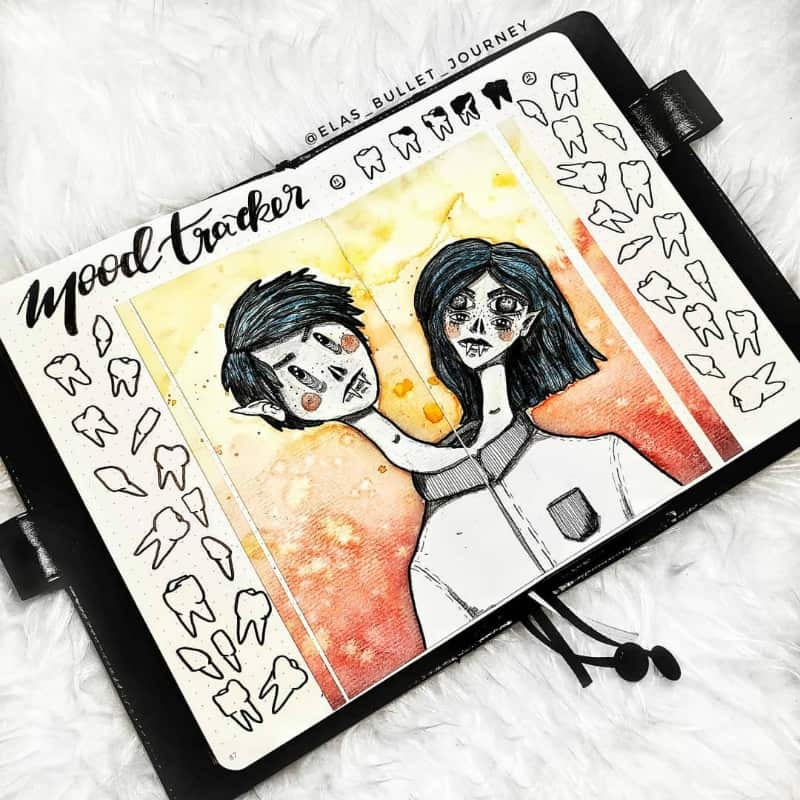 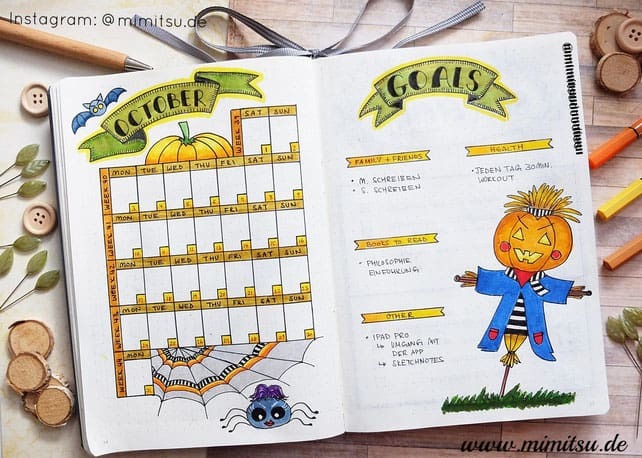 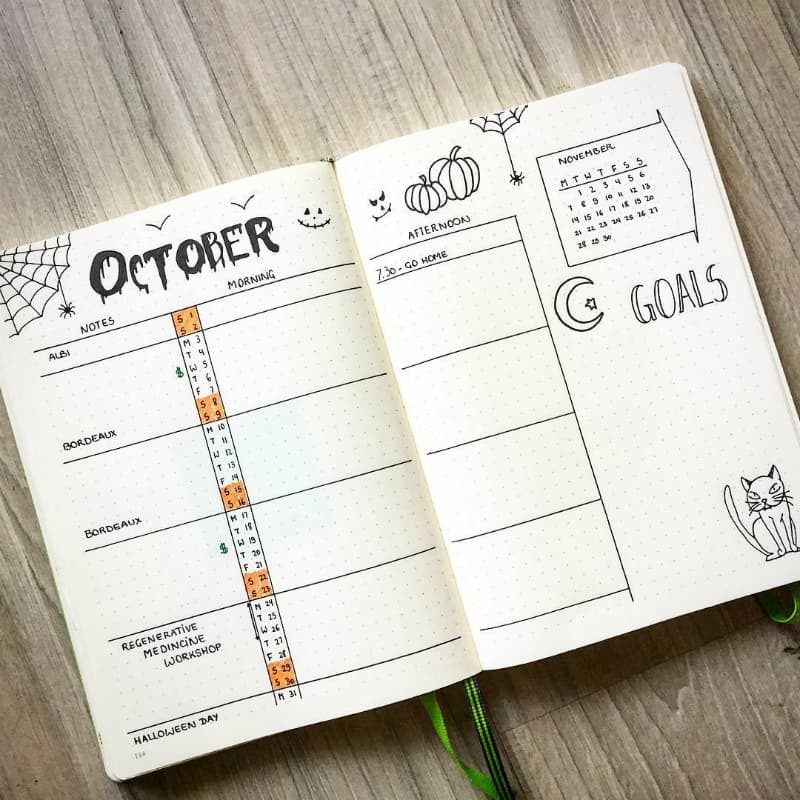 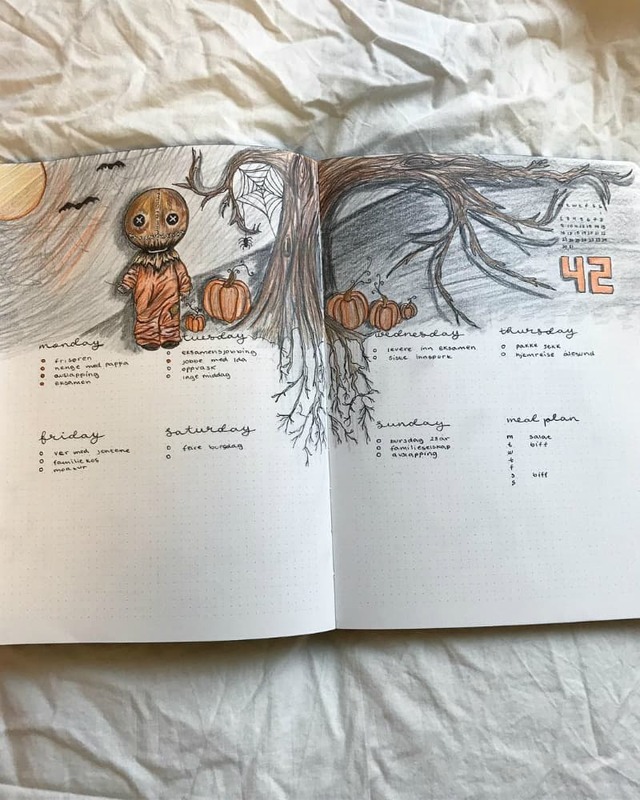 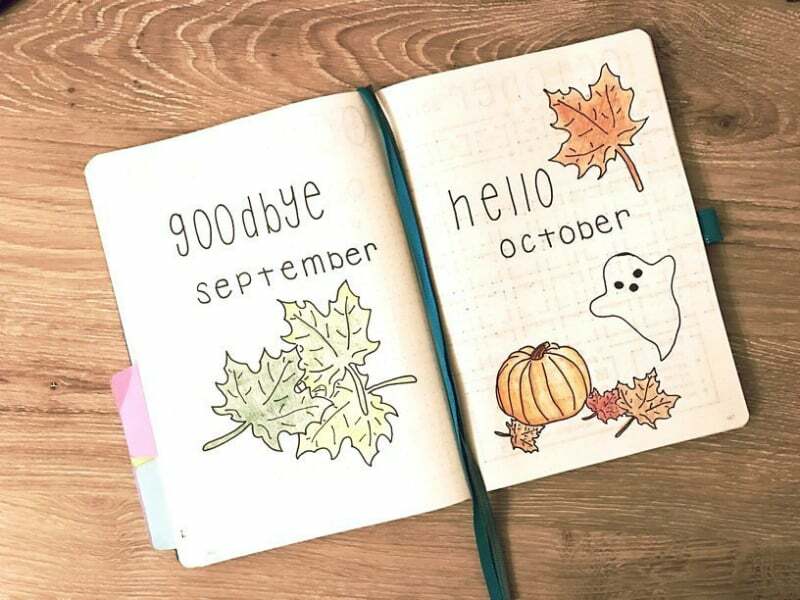 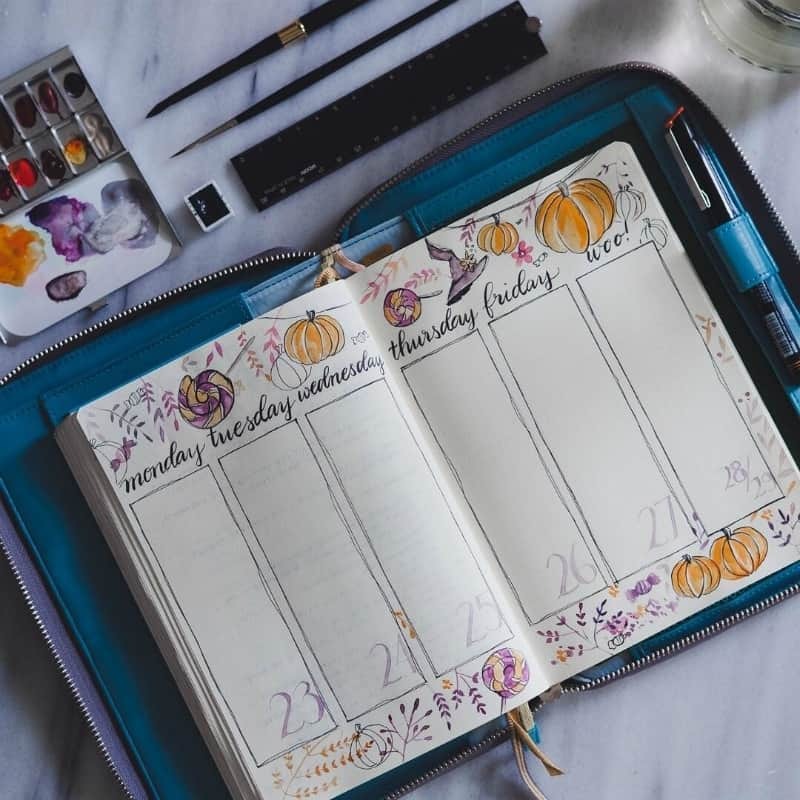 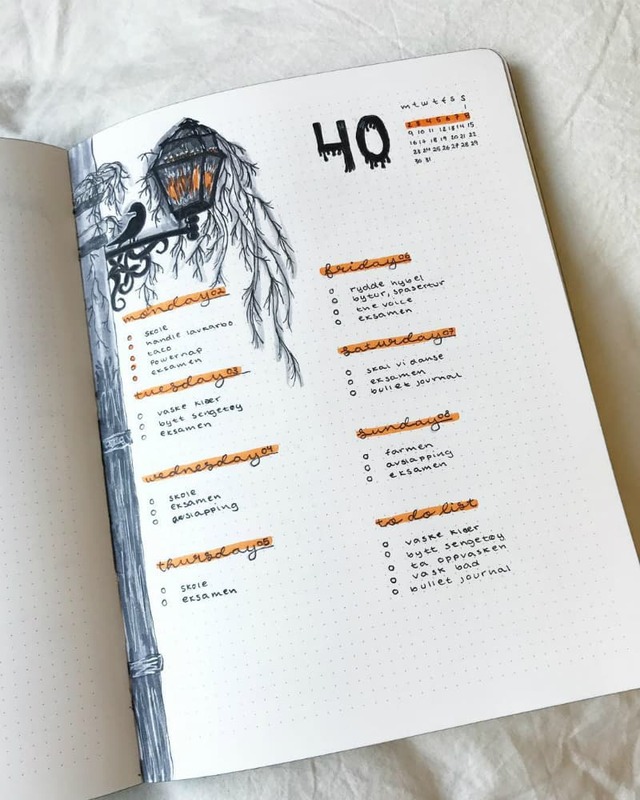 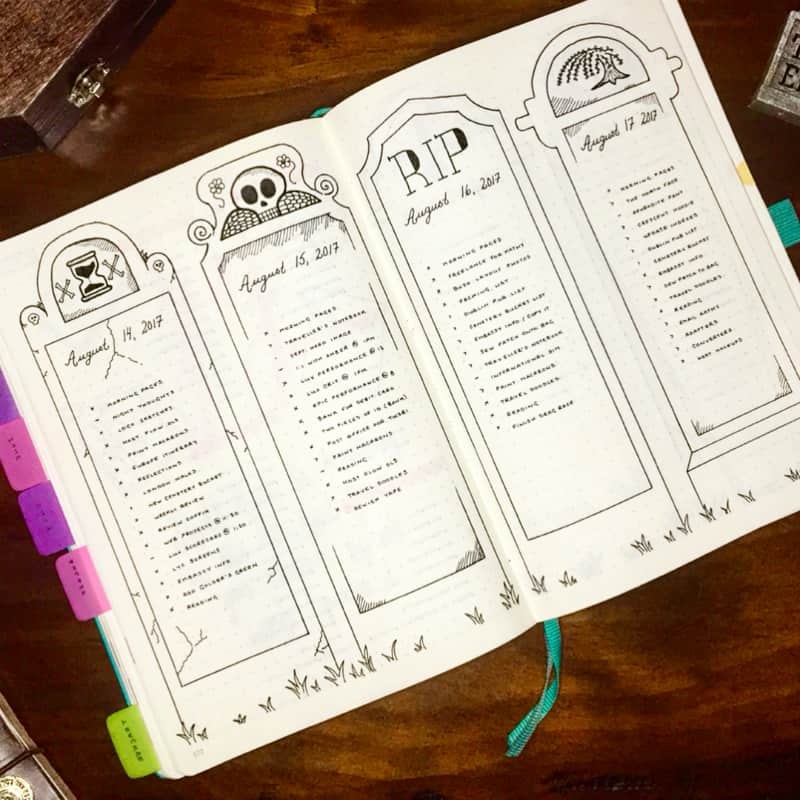 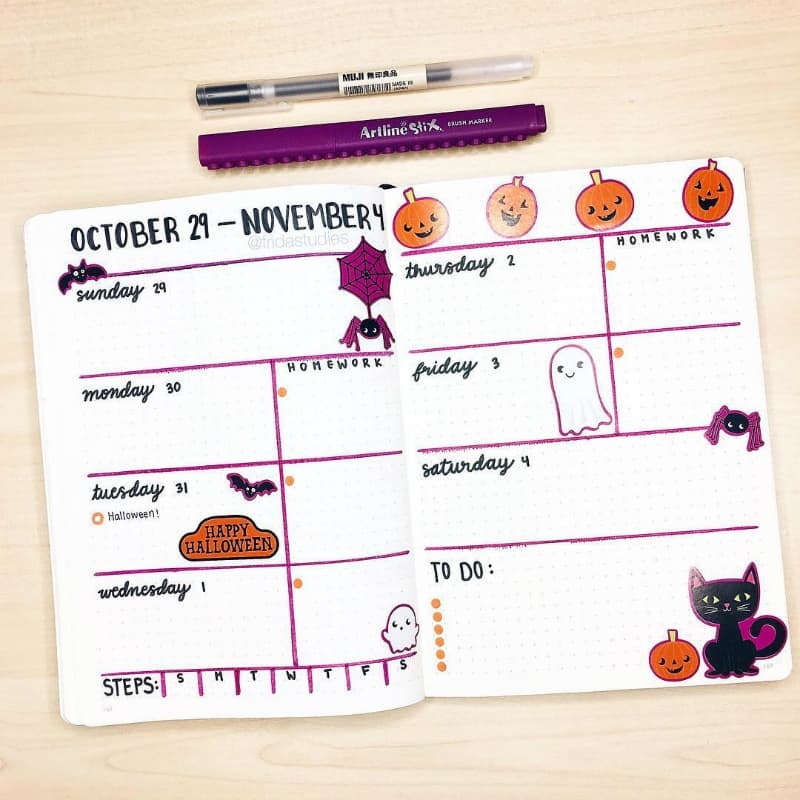 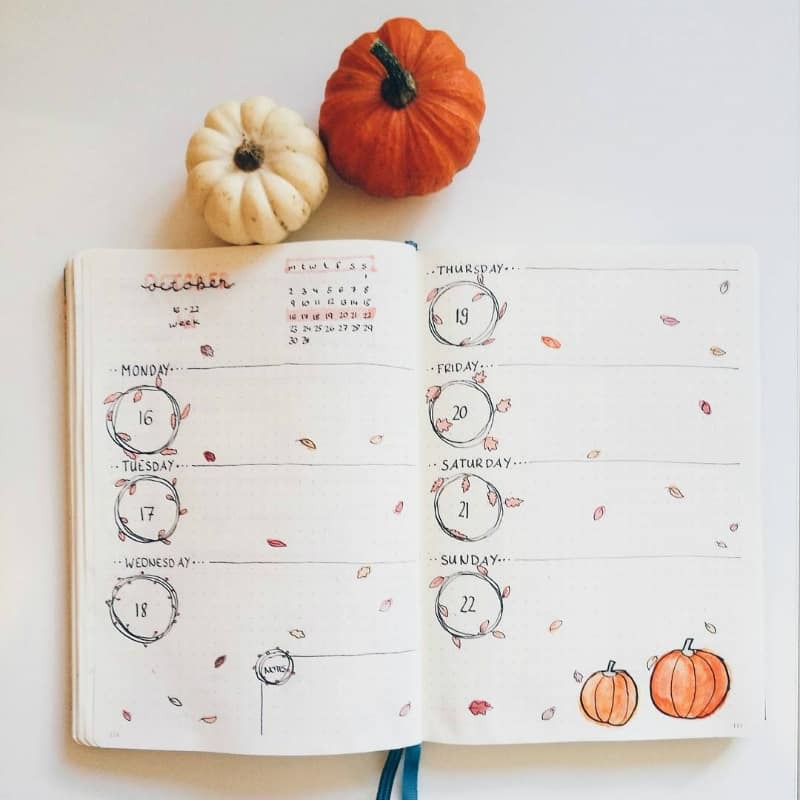 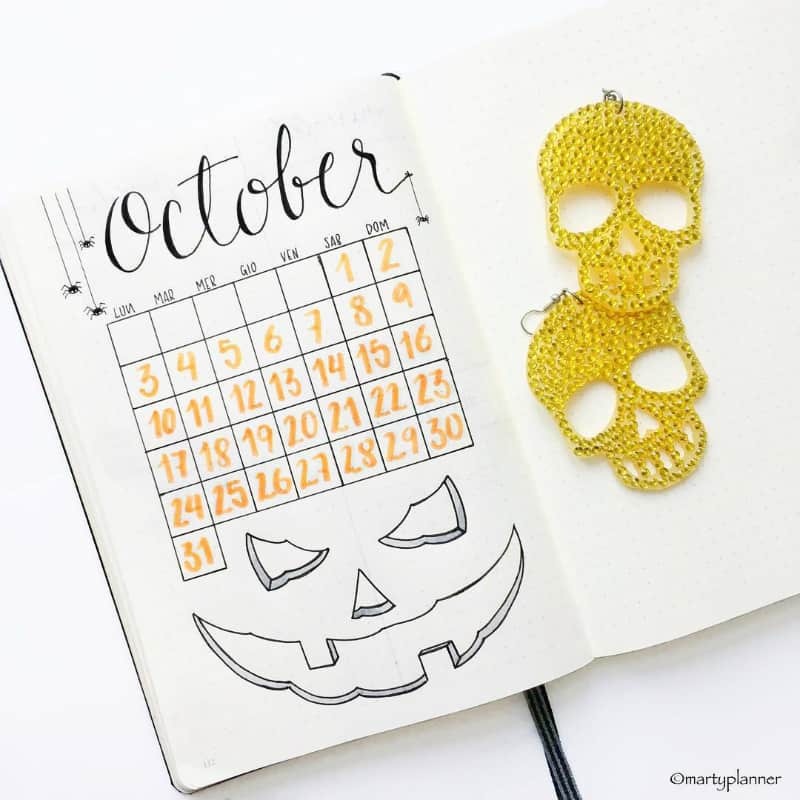 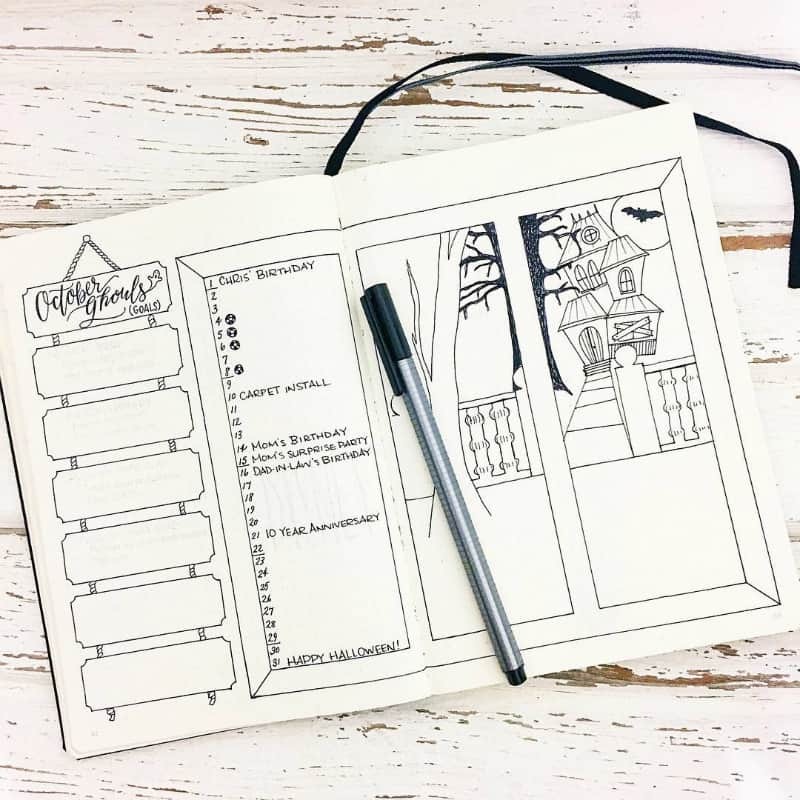 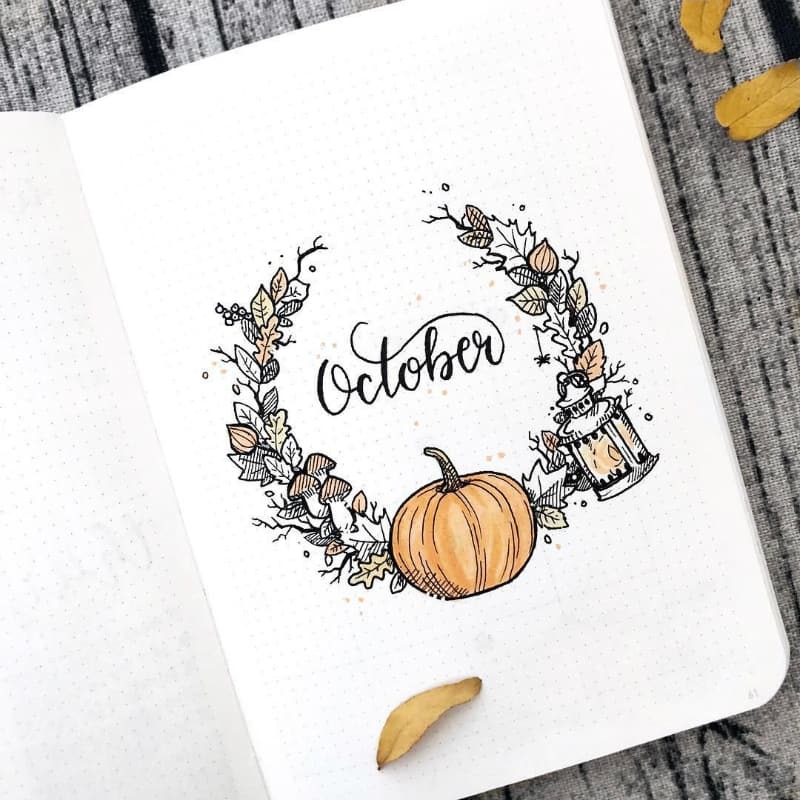 Adding lots of Halloween doodles to your pages such as pumpkins, witches’ hats, spell books, ghosts, potions and spider webs etc can create a halloween vibe in your bullet journal. 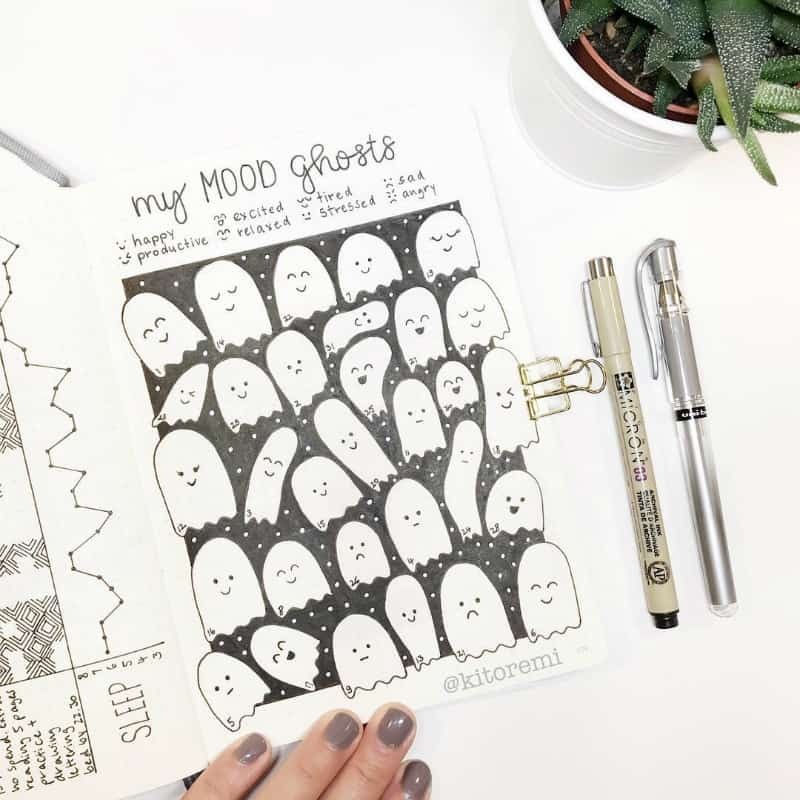 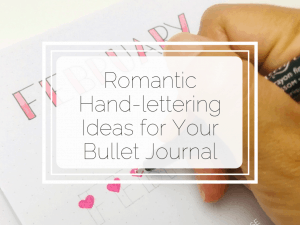 If you don’t feel like you’re confident enough to doodle in your bullet journal, you can always try using stencils, stickers or washi tape or all three. 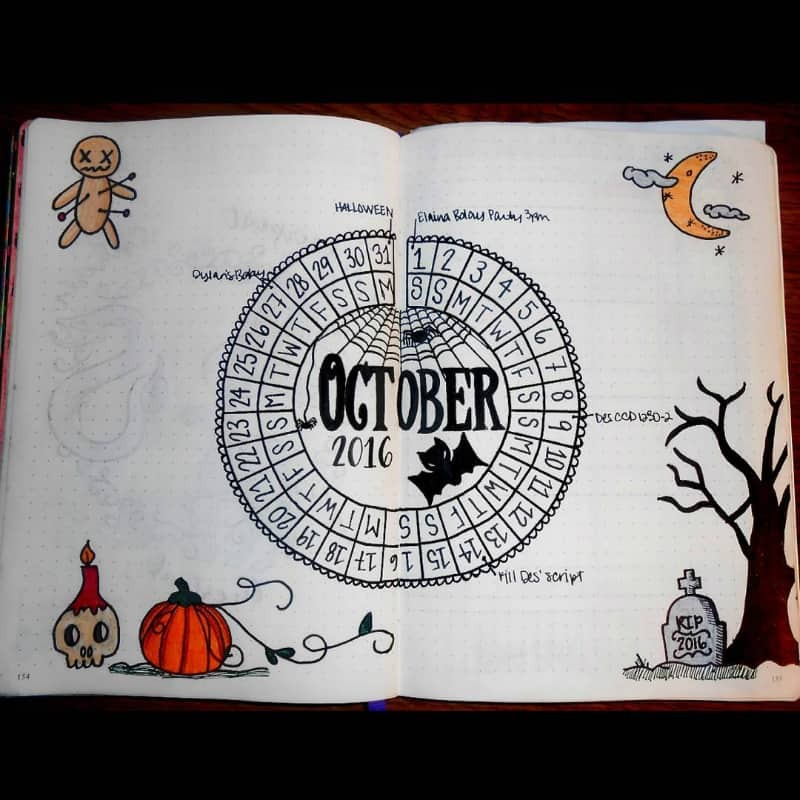 If you love tracking your mood, you’ll need a Halloween themed mood tracker for October. 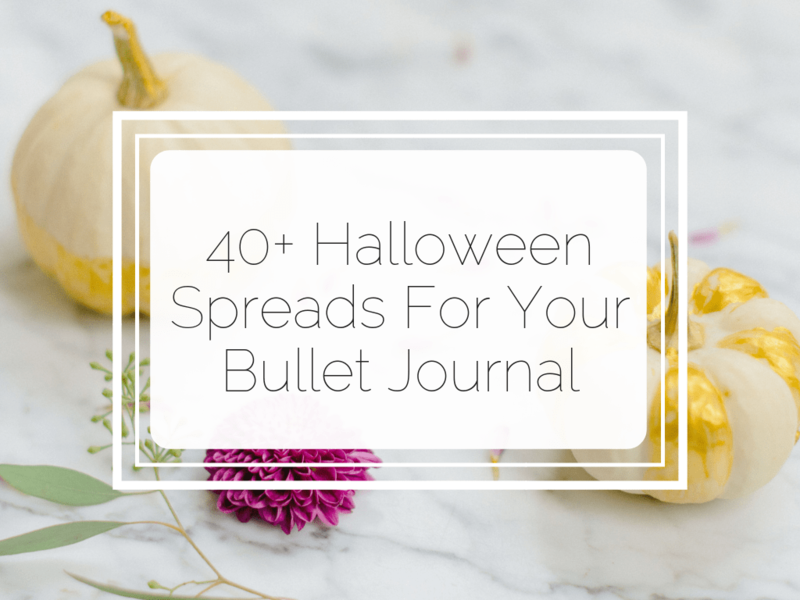 And this one by @elas_bullet_journey is absolutely STUNNING! 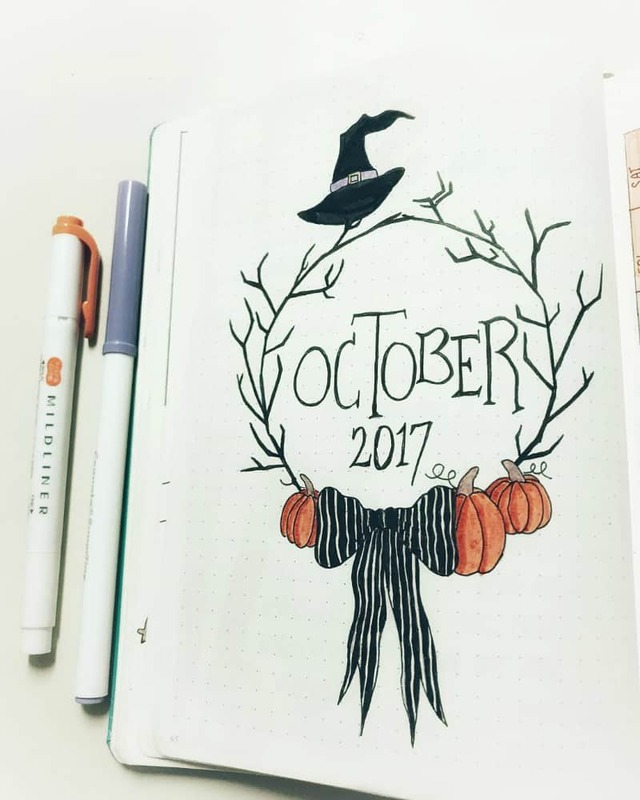 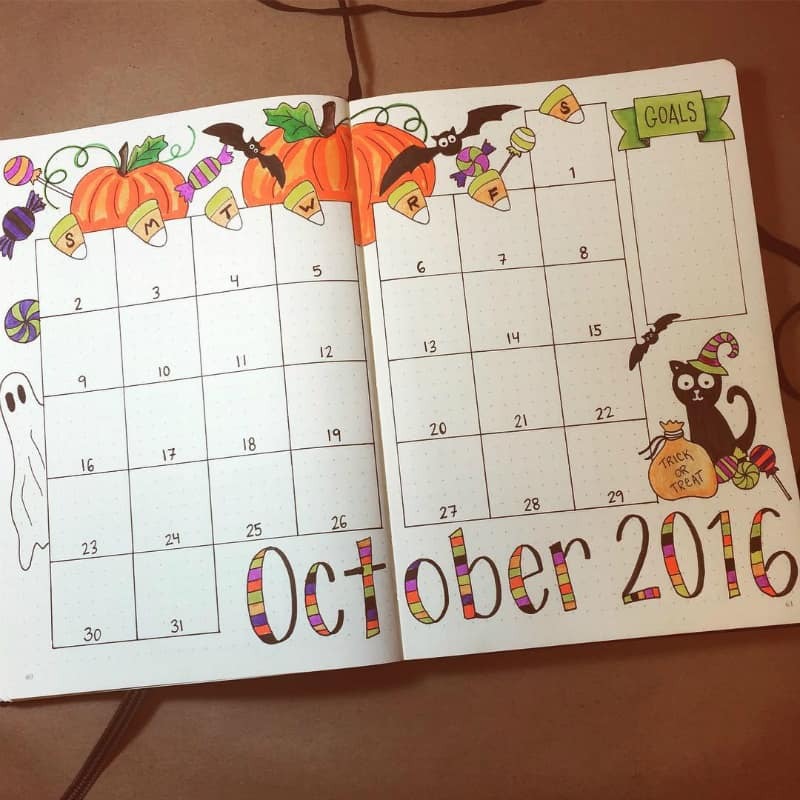 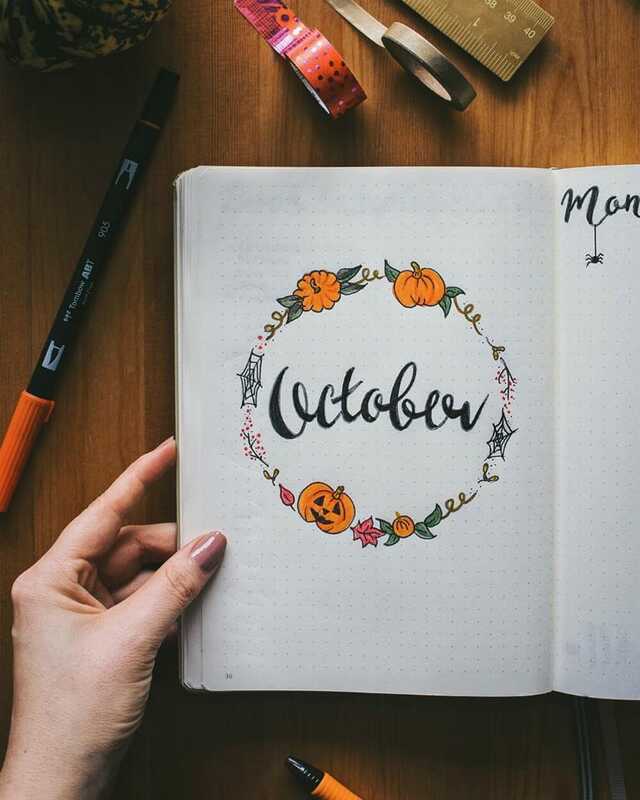 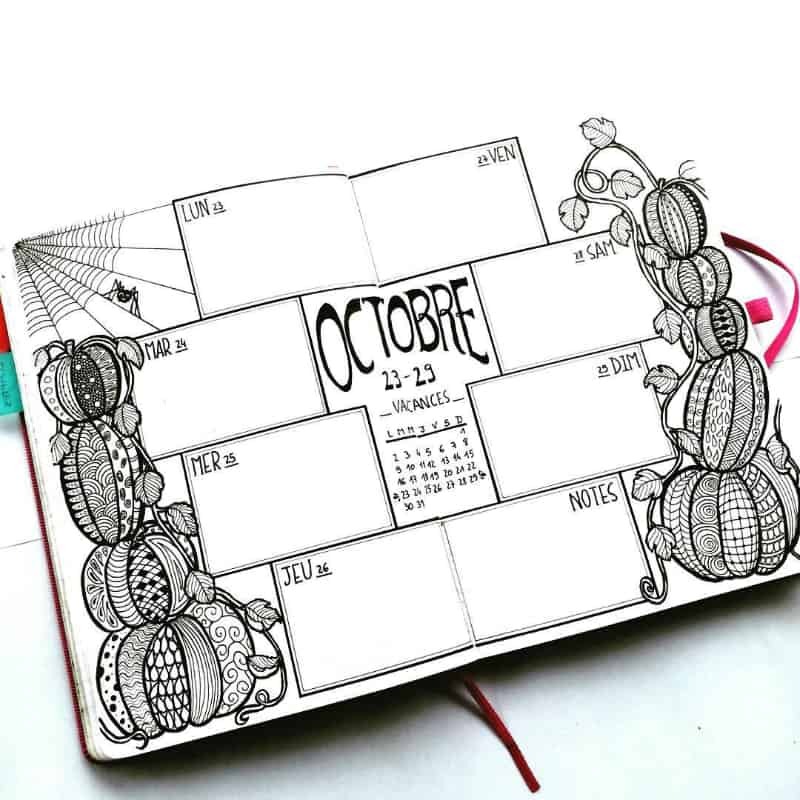 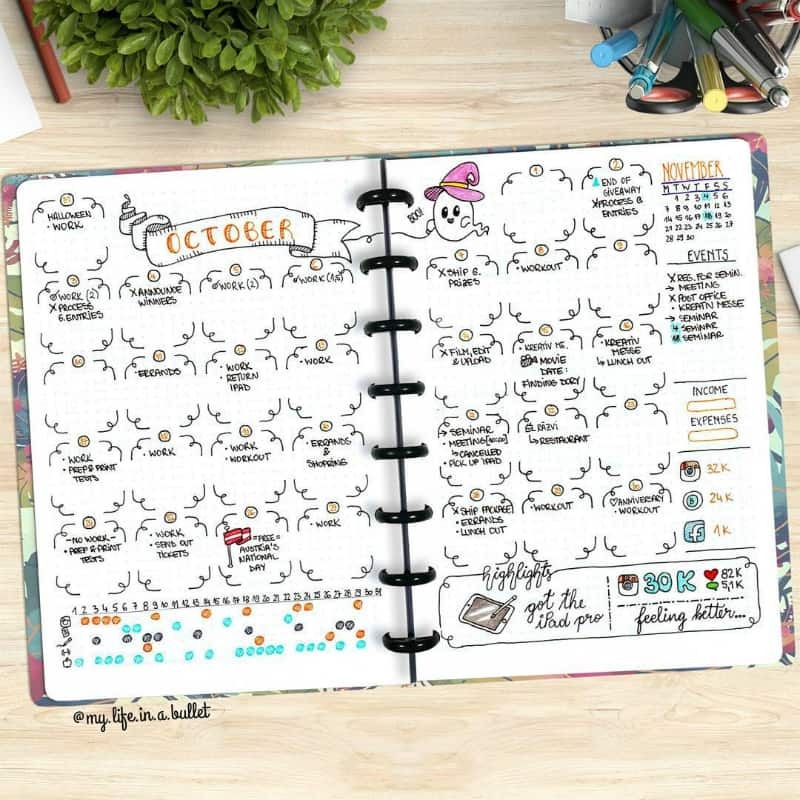 Here are some great ideas for October monthly cover pages, or welcome pages in your bullet journal. 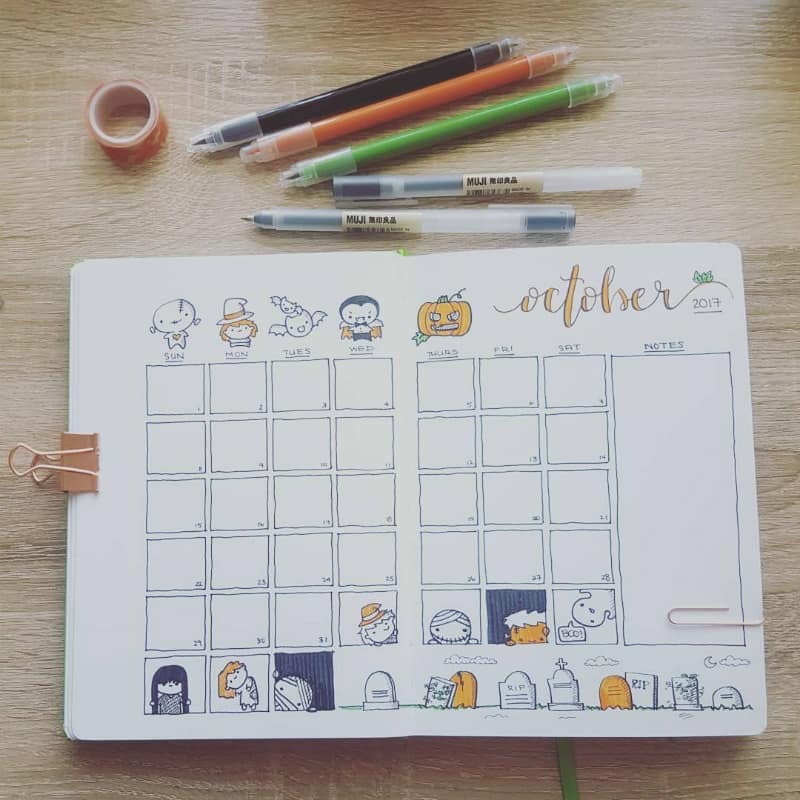 They are all halloween themed, using colours and/or doodles that I’ve already talked about. 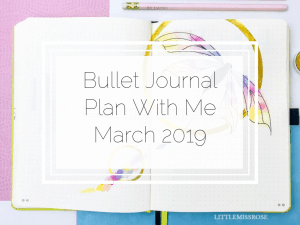 After your cover page/welcome page, you will need a monthly log in your bullet journal. 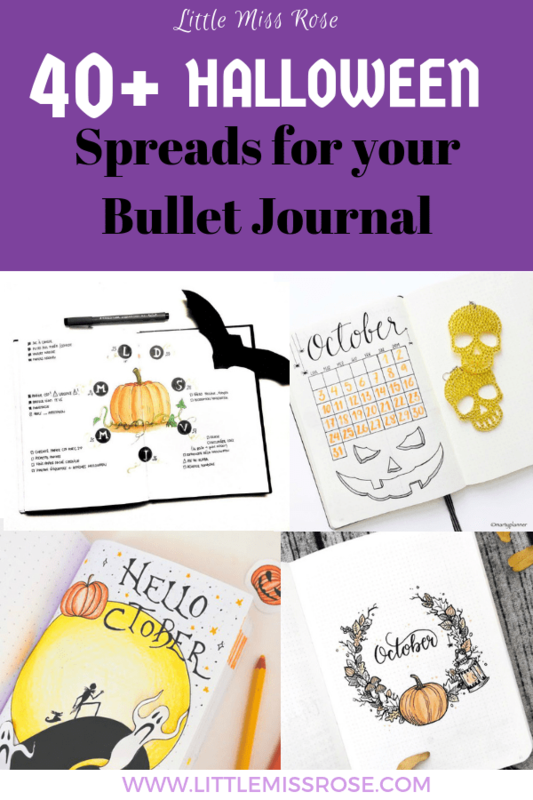 You can go with the traditional monthly log from the bullet journal system, or try a calendar format. 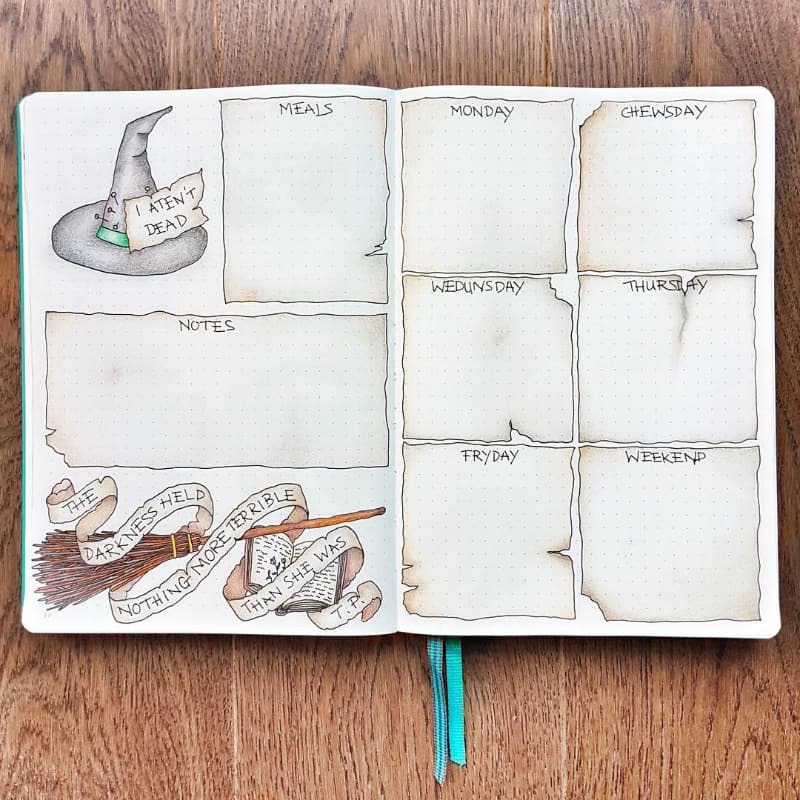 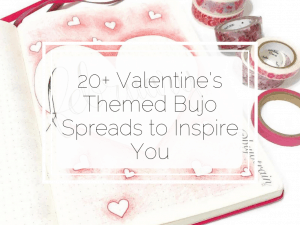 If you prefer bullet journal weekly spreads to daily logs there, here are some great examples for you! 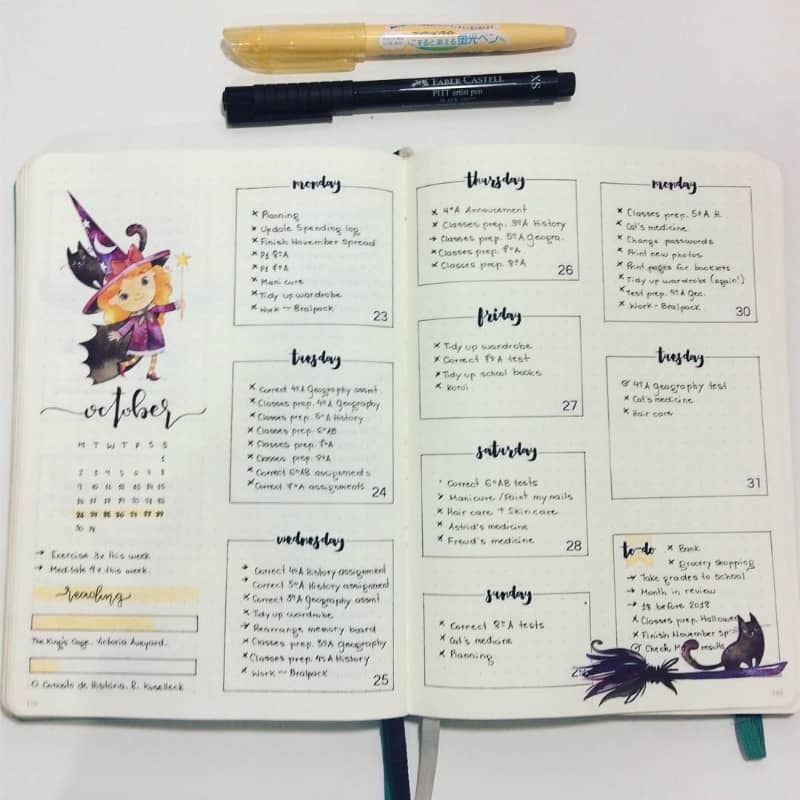 All decorated with a beautiful halloween theme! 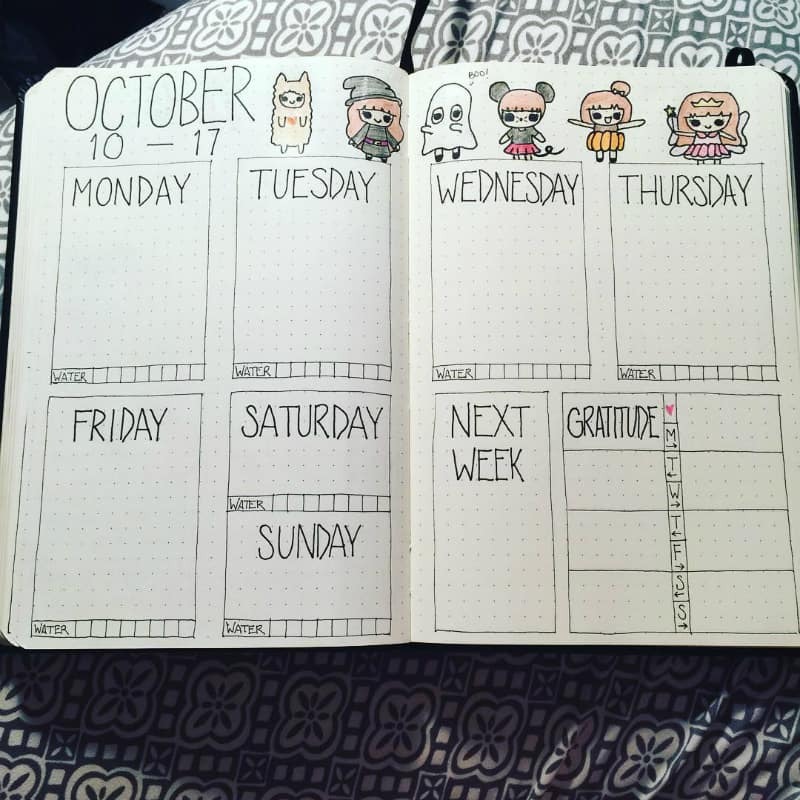 Note how the black and white weekly layouts are just as effective as the ones that use colour! 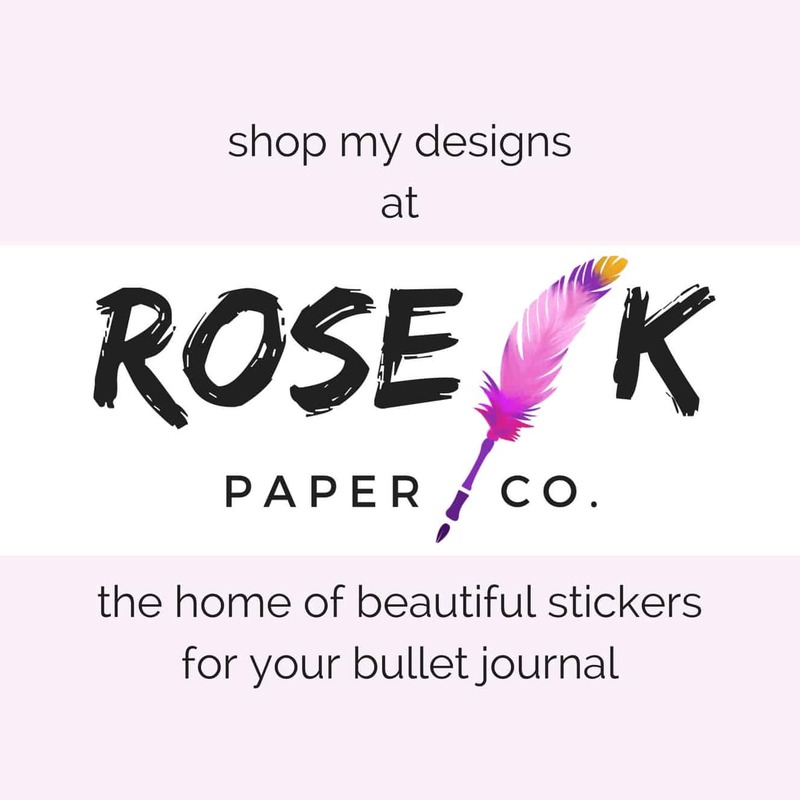 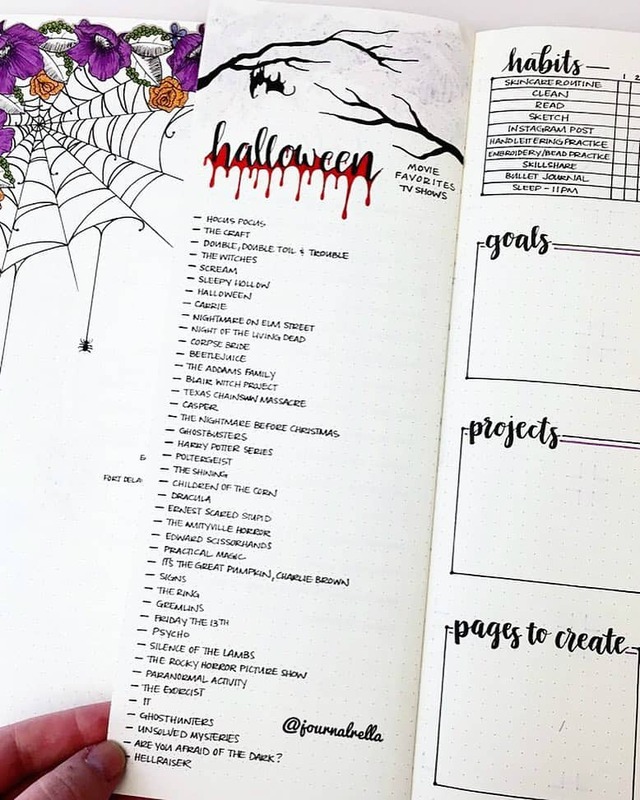 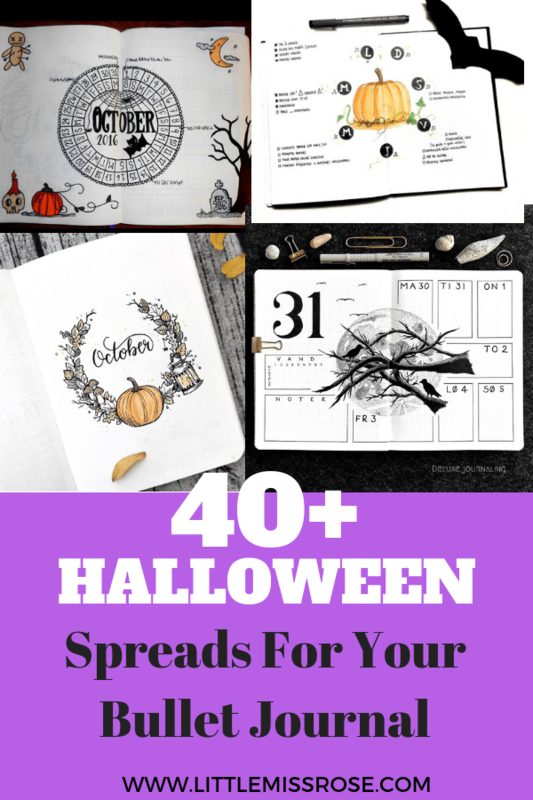 If you’re in search of lists and collections to add to your bullet journal with a halloween theme, then check these out! 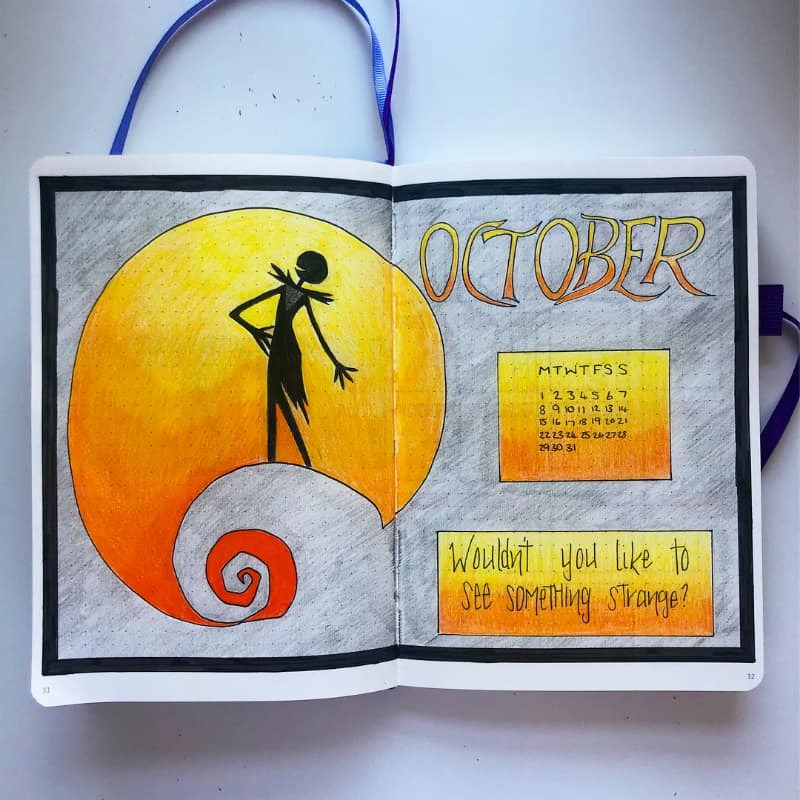 Elizabeth @myartsybujo has created a list of Halloween movies to watch during October. 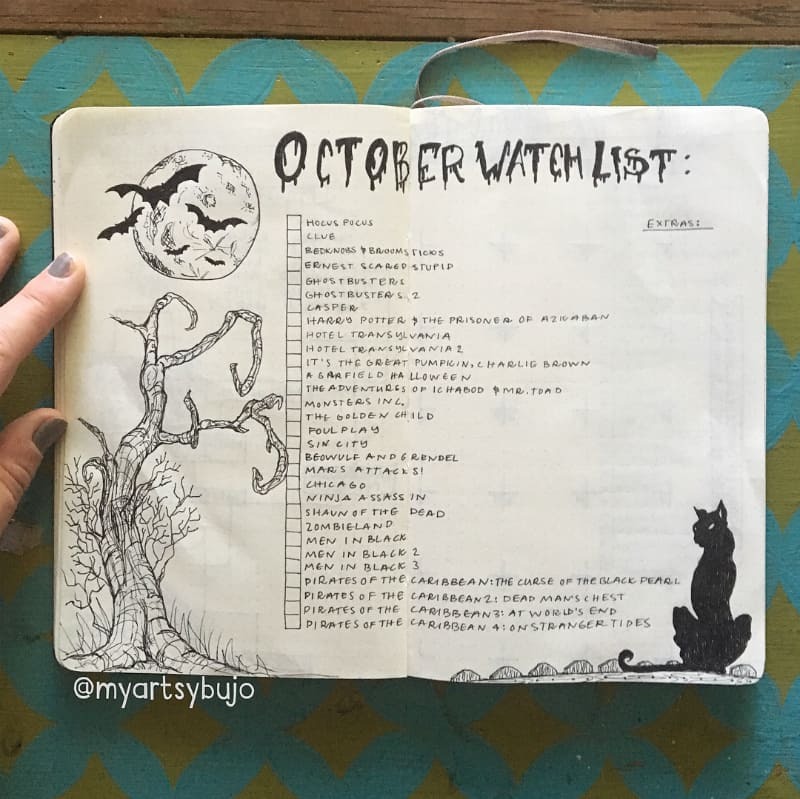 Jennifer @journalrella has done the same, but her list also includes TV shows to watch and scare yourself stupid with! 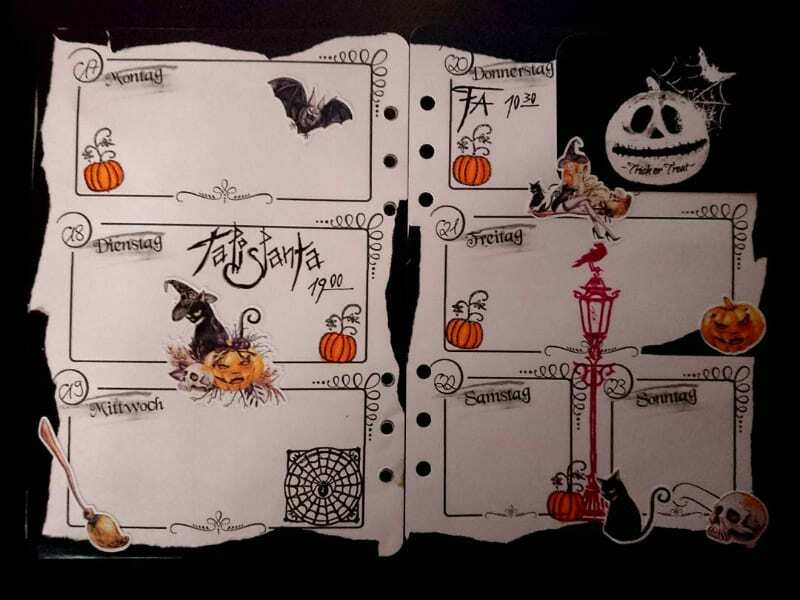 The following spread by @lacqueredworld is an organisation spread getting everything ready for Halloween. 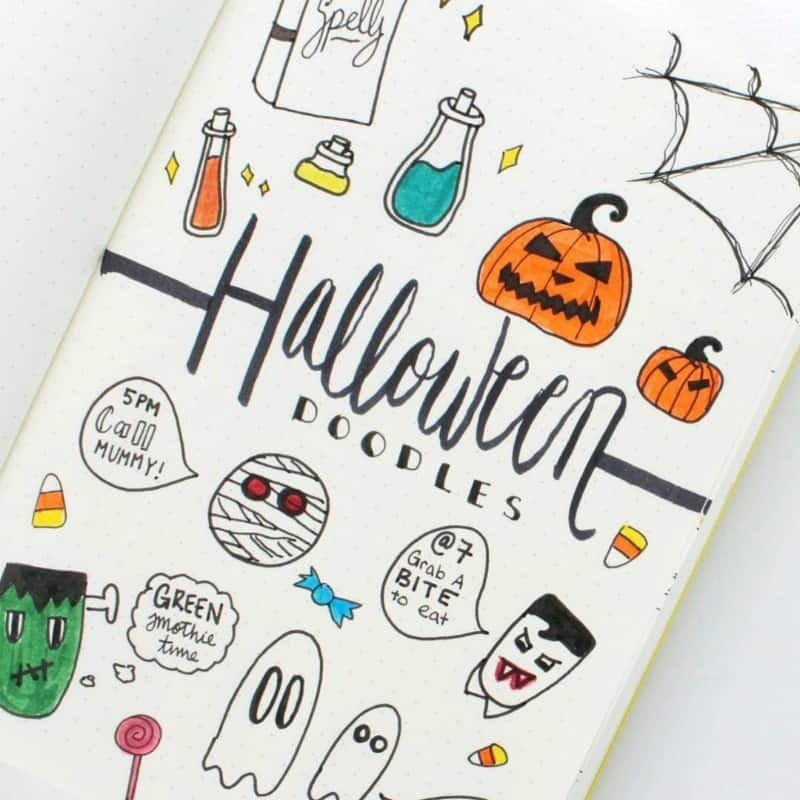 Perfect if you’re planning a halloween party or just getting ready for the trick or treaters that will knock on your door! 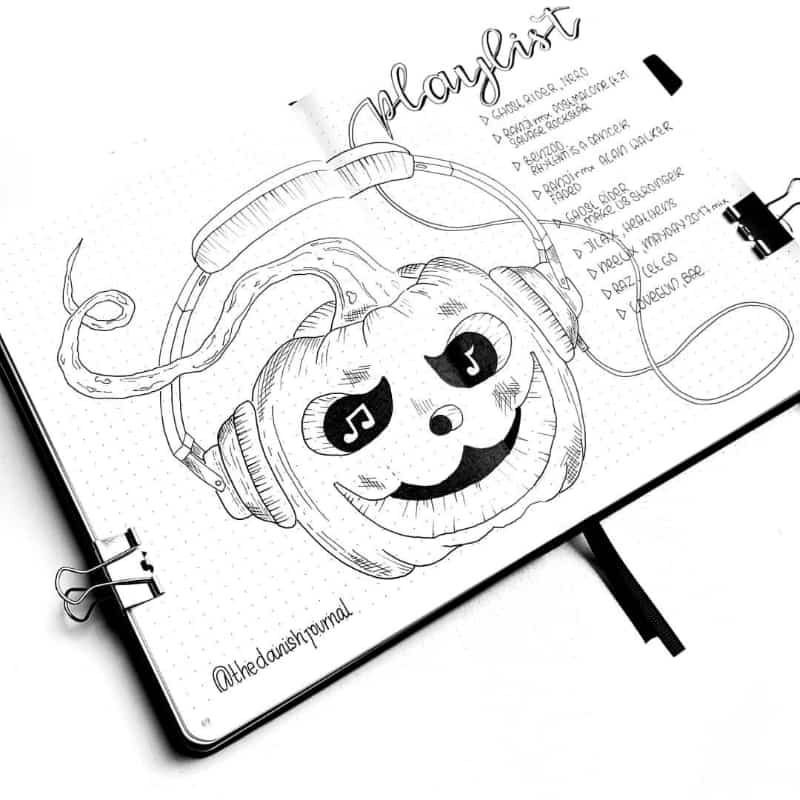 This halloween themed playlist spread is GOALS!